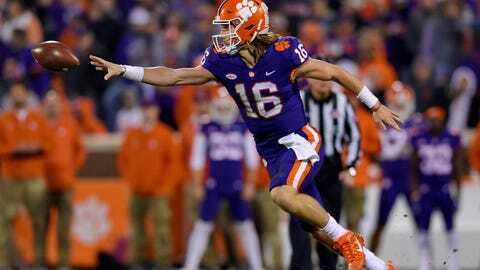 CLEMSON, S.C. (AP) — Both South Carolina’s Jake Bentley and Clemson’s Trevor Lawrence hope to make their first winning impact on the Palmetto State rivalry. Bentley won’t worry about that, confident his play the past few weeks has helped energize South Carolina’s offense that’s averaged about 43 points a game the past three weeks. The Clemson QB said all the right things when he shared the quarterback spot with last year’s starter, Kelly Bryant. He was humble and honored when his one-time mentor in Bryant left the team after getting demoted. And he has helped Clemson light up opponents ever since with the Tigers averaging 47 points a game in his seven starts.